Rebound catch is an intermediate throwing and catching activity. The activity allows players to explore the effect of different ball trajectories. Player experimentation, observation and understanding can be facilitated. Play in groups of 4. Groups stand 3-4 metres away from a wall. 1 player starts by throwing a ball at the wall. Players attempt to take rebound catches and field the ball. Change feeder every 3 throws. How can you make sure you field as many balls as possible as a group? 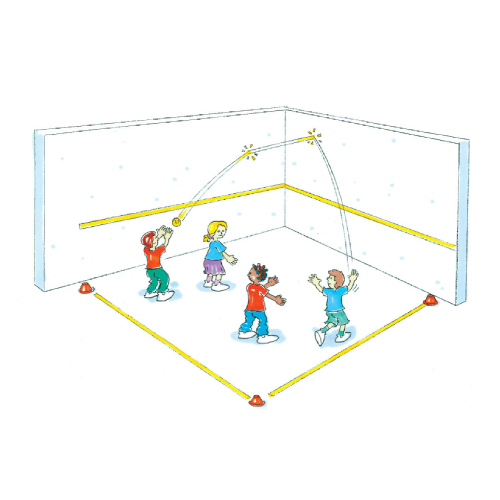 Why is it important to watch the ball carefully when it hits the wall? What happens if the ball hits 2 different corners of the wall?